Home / Products / Seasonal / Christmas Chocolates / Mint Cookie Malted Milk Balls, 1 lb. 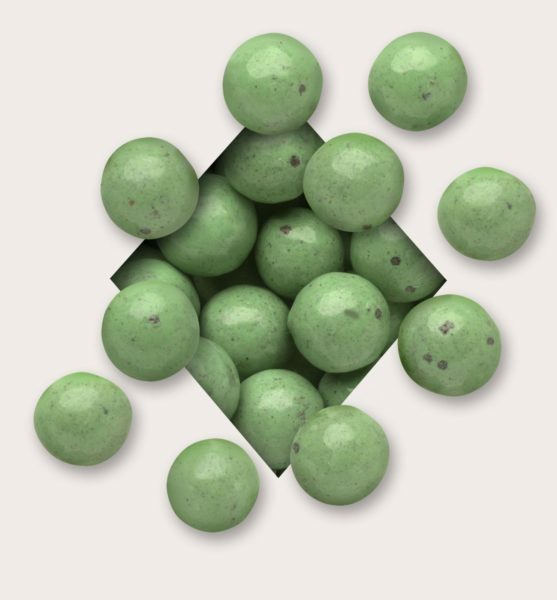 Mint Cookie Malted Milk Balls, 1 lb. Delicious malted milk center covered in a minty green coating blended with real chocolate cookie pieces for an extra crunch. Sugar, Palm Kernal Oil, Nonfat Milk Powder, Whole Milk Powder, Whey Powder, Palm Oil, Soy Lecithin (an emulsifier), Vanilla. Chocolate (Sugar, Chocolate Liquor, Cocoa Butter, Soy Lecithin and Vanilla). Malted Milk Balls [Corn Syrup, Whey, Malted Milk (Malted Barley, Wheat Flour, Milk, Bicarbonate of Soda, Salt), Sugar, Malt Extract, Coconut Oil, Mono & Diglycerides, Artificial Flavor], Ground Cookies [Enriched Flour (Wheat Flour, Niacin, Reduced Iron, Thiamine Mononitrate, Riboflavin, Folic Acid), Sugar, Cocoa Processed with Alkali, Palm Oil, High Fructose Corn Syrup, Choc. Liquor, Salt, Corn Flour, Dextrose, Sodium Bicarbonate, Soy Lecithin, Confectioner's Glaze, Gum Arabic, Natural Oil of Peppermint, Yellow #5 Lake, Blue #1 Lake, Soy Lecithin].